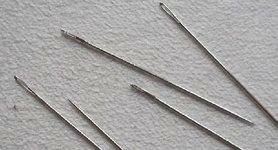 Tapestry needles: These needles have a blunt end so they easily go through the holes in the canvas without splitting any threads, and an elongated eye for easy threading of different types of embroidery threads. 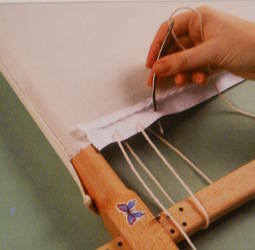 Use on canvas, even weave fabrics and linens for counted work. Embroidery needles: Long thin eye to allow for easy threading of embroidery threads. Sharp point for use on closely woven embroidery fabrics. Sharps: Sharp point but with a short fat eye to take single sewing threads. 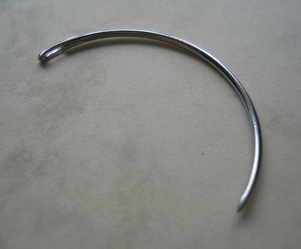 Use for general purpose sewing and dressmaking. Crewel - a large embroidery needle; beading needles - long and thin with small eyes allowing beads to be threaded on; chenille needles - like tapestry but with a point for open weave fabrics. See below for even more! The higher the number, the finer the needle. The needle makes the hole for the thread to pass through, not the thread. If you can hear the thread go through the fabric, then the needle is too small. Equally, if the needle is too big, it will leave a hole. Just thought I'd share .stabbed myself very slightly with bracing needle. Didn't think anything of it till later when extremely painful swollen red. Visit to minor treatments now on ABs. Really felt very poorly so yes be extremely careful! Sarah Says: Oh no Rebekah, I hope you are OK now? Scratches from any needles can do this; only surgical/wrapped needles are sterilised so always disinfect any needle pricks/scratches immediately.